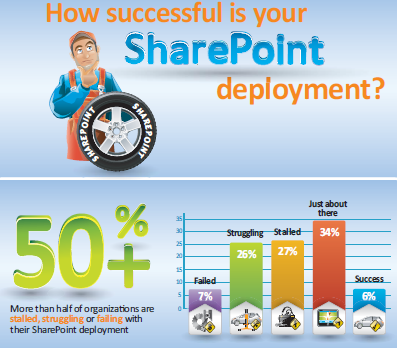 Is Sharepoint Still An IT-Driven DM Solution? Our latest AIIM Industry Watch is an in-depth look at where we are with SharePoint – especially in terms of how information managers are looking to work with the technology post Microsoft’s latest upgrades to its core collaboration system. There is quite a lot going on, especially in terms of cloud and DM (document management). Let’s share some of that insight. SharePoint has come to have a major role as a document management/ECM (enterprise content management) solution for many enterprises, although this is a departure from its original design. Indeed, many more firms have come to DM through SharePoint than through buying specific DM products. Certainly, adoption across the enterprise has been much higher for SharePoint and usage across multiple content-types far broader than for other imaging or document systems. So how well does SharePoint manage documents? The focus of debate in the past few years has been over to what extent can SharePoint solve the content management, records management, and social collaboration needs of the enterprise as a whole. With the latest (2013) release of the system, there’s been a further complication of that debate – particularly regarding the on-going need for customisation of the technology to make it more useful in this regard, plus the use of third-party add-on products, which Microsoft encourages, but is always chipping away at. There is also the move by Microsoft to bring SharePoint closer to its favoured cloud solution, Office365. What’s hampering users? The biggest on-going issues were challenges around user adoption, extending the business scope, and governance. Achieving uniformity of classification and metadata is also a big issue, according to respondents. That doesn’t seem to be discouraging users however. In the latest version, Improved search and navigation is getting the most votes for best new feature, though closer integration with Outlook, Exchange and Lync, better mobile device support and improved retention management all get the thumbs-up from practitioners, too. No wonder, perhaps, that nearly half (45%) plan to be on SharePoint 2013 by mid 2014. Note that only 18%, though, say they are using the standard vanilla product; 30% are using a customised version but the majority (53%) are using a standard version with at least some alteration and/or third-party add-ons to help them meet their needs. In the full AIIM report, we detail what challenges users see with SharePoint and to what extent they want to join Microsoft’s journey into the cloud. Space constraints forbid me from discussing these in more depth or any of the other fascinating issues we’ve uncovered. I do strongly recommend that you check out the full study. As a parting thought, what stands out from the report is this stark fact: according to our representative snapshot, here in Q4 2013 SharePoint is still an IT-driven platform. This is a fact clearly reflected in the high levels of customisation felt necessary to make it work as a DM/ECM solution, reluctant user take-up, and the limited spread of business processes we found it supporting. Should DM practitioners be satisfied with this? Do you agree/disagree? Where do you think SharePoint should go next? I’d be very interesting in carrying on the debate. At the very least, I hope we can all agree that any DM conversation that is being conducted just in the IT department is not ever going to be a helpful one. What do you think? Previous Previous post: Document Storage – Has it Really Changed? Next Next post: If Document Management is so brilliant, why isn’t everybody doing it?